Yes, alginate is completely safe and can be used in direct contact with skin. Alginate is extracted from natural seaweed. It is the same material that has been used totally safely for making dental impressions millions of times by dentists in people's mouths for well over half a century. Alginate is a flexible mould- and impression-making material which is perfect for casting. It is a very fine powder which is mixed with water to form a liquid gel that can pick out the tiniest details. Is the alginate mould re- usable? No, the mould is not reusable as the 3D cast needs to be peeled away from the mould. The alginate is flexible but easily tears when the cast is peeled away. I will therefore take a new mould for each cast. Should you buy a DIY casting kit? The images Online and on the Home Casting Kit Box makes it look pretty easy BUT I've heard of many people not managing to get the baby's hand or foot into the alginate before it sets, let alone managing to make a hand or foot cast. They are usually just left with the frame with nothing to put in it!! The Home Casting Kits are not cheap, often between £50-60, and they usually contain cheap materials that are not suitable to make a good cast. Also the Kits don't contain tools to properly finish the cast. (these tools would need training and practice to use anyway). 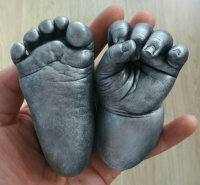 Many people would like to cast a slightly older child's hand or foot but often the frames supplied are only deep enough for a very small baby.Larger casting kits are also available, but with larger casts just mixing alginate takes skill, practice and equipment. Let alone being able to cast with out missing fingers. Please do your research and spend your money wisely. I am happy to discuss all your requirements. For larger casts I am always happy to do payment plan to spread the cost.